Our Deer Resistant Wildflower seed blend contains species that are resistant to deer and other wildlife, meaning that deer will normally avoid them if other food sources are available. However, if food sources are scarce even these normally avoided wildflowers may be browsed by deer. This blend contains wildflowers found throughout much of the United States, with both early and late blooming wildflowers for color through the growing season. This blend has been designed with an emphasis on native wildflowers, and is designed to be adaptable to a wide range of conditions within the geographic region shown on the distribution map. 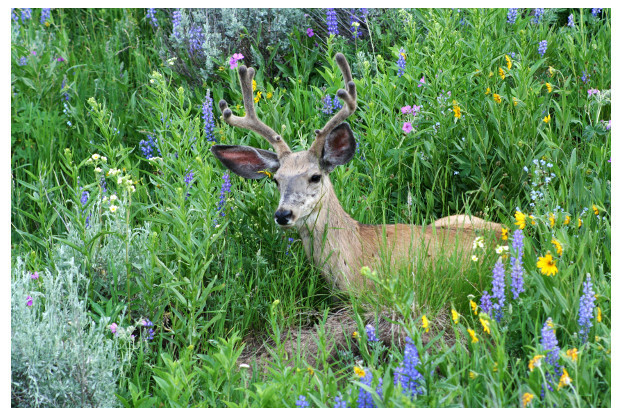 Our Deer Resistant Wildflower Seed Blend contains wildflower species that are resistant to deer and other wildlife, meaning that deer will normally avoid them if other food sources are available. However, if food sources are scarce even these normally avoided wildflowers may be browsed by deer. The colors in bloom will vary at different times of the year, and depending on how much water and sunlight are available to the wildflowers. The colors which you will see at different times of the year will include: blues, purples, reds, yellows, whites and oranges.